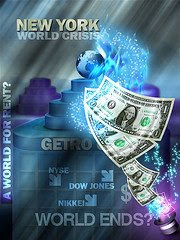 We all know that a financial crisis is going on all over the world. So, from businessman to general investor everyone is worried about it. But this crisis period will not remain same, everyone will overcome it. But now what you need to know is how you can manage your business & keep the consistency in this competitive market. So, In this post I am trying to tell some possible ways to overcome this crisis. It may helpful for you. 1. This is not a right time for the new invester, wait for sometime while the market will become stable. 2. Stay focused on the long term, It is very important. 3. In this crisis keep the good relation between you & your employee for mental support. 4. Try to use every possible communications channel. 5. Before taking any financial step, Just look into its authentication. 6. If customer service you are providing be smart about your customers. 7. Don't go for any finance related projects which may increase your financial pressure. 8. Try to estimate very professionally before investing. 9. Make a budget of your minimum expenses also. 10. Don't miss to pay the monthly installment to recover your debt (If you have). 11. Try to avoid taking credit from any non government financial organization. 12. Keep avoid to provide credit to any other person (But keep a good relationship with everyone). So, the above points may help you to recover this financial crisis. I think the UK government has done well so far in this crisis.